The legend of Vinus, the Heron, started on the Hérault River banks, at the foot of Château Paul Mas in Pézenas. The story goes that Vinus the heron preferred eating grapes grown on clay & limestone hills of the hillsides of the Hérault Valley to the fish form the river. 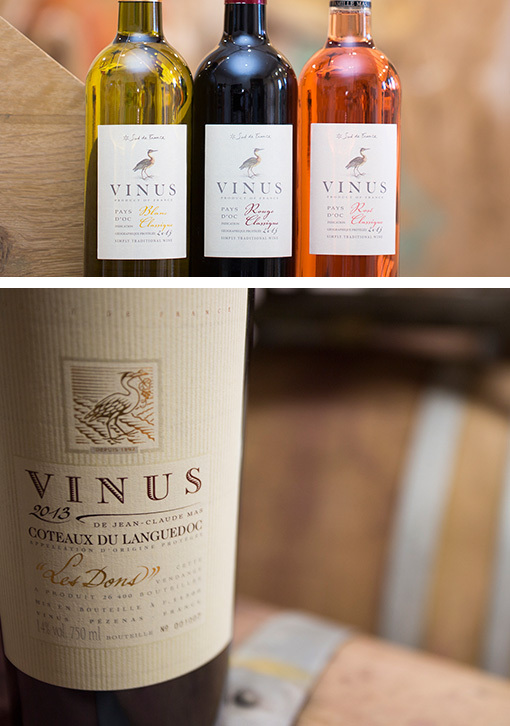 Domaines Paul Mas adopted Vinus as its emblem, symbolising the quality that this hillside sites can produce. The vineyards yield small quantities of grapes, concentrated in both colour and aroma, resulting in wines wich are true to the terroir. The character of each grape variety is further enhanced by the skill of the winemaker. Different varieties are planted on the most suitable terrain, schist for Syrah, sandstone for Chardonnay, well drained hillside sites for Cabernet Sauvignon. Our Reserve cuvees and appellation wines are aged in oak barrels, bringing elegance and complexity.